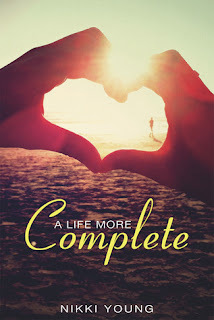 Reading A Life More Complete by Nikki Young was bittersweet for me. Bitter only because an unfulfilling romance made me feel sorry for the main character but so so sweet because of the lovable heroine, who I was routing for throughout the story, even when she made me a little aggravated. Whenever I read great chick lit, I always want the main character to fall madly, deeply in love. I’m obsessed with guessing who is going to be the handsome charmer to sweep her off her feet. What a surprise when I was reading A Life More Complete and I found myself wondering who Krissy would fall in love with. I’m usually pretty quick to figure it out, but this book kept me guessing! Would it be her easy going friend Ben? Or would it be the mysterious man from her past, the one who broke her heart all those years ago? At the beginning of the book, Tyler was just a blip on her past’s radar. And even though Krissy didn’t talk about him right away, he was still the elephant in the book, so to speak. A Life More Complete tackles tons of life’s most burning questions. Does true love ever really fade? Is a successful career worth sacrificing relationships? How much forgiveness can one really give? All of these questions and more are thrown at Krissy and she proves to herself and the ones around her that she’s the kind of strong willed woman who can handle it. Nikki Young did an amazing job of writing a evolutionary character. Krissy isn’t the same person on the first page as the one who emerges at the book’s end. One moment, I am happy for her, the next I was mad at her, then I was waving my hands in front of her face, saying “Hello! What were you THINKING?” My reactions to her reminded me of many gab sessions I’ve had with my best friends over the years. One thing that stayed constant was my admiration for Krissy’s confidence and control. Whatever was thrown her way, she handled it like a champ. There’s a surprise around every corner in this book. Some were a tad predictable, but that didn’t take away from the joy of watching the lively characters react to them. Thank you to Nikki Young for our review copy. All opinions are our own.